The most colourful state of India draped in gaudy royalty, romance and chivalry, Rajasthan echoes the saga of traditions and undulated heritage. The Rajasthan Heritage Tour brings a rustic feeling and flavour of the state to a traveller. Arrive Delhi International airport. On Arrival, you will meet our representative at the airport. He will assist for transfer and will accompany you till check in at Hotel Oberoi Maidens. About the Hotel : Oberoi Maidens Hotel is one of Delhi's oldest hotels, built in the early 1900s, and has retained its colonial charm and architecture. Its spacious rooms with high ceilings are unique when compared to the box-sized rooms of modern hotels. Late 19th century architectural elegance is reflected in the classical rooms and the elegant restaurants. Today, leave for full day city tour visiting both New & Old Delhi. Visit Jama Masjid - the largest mosque of Emperor Shajahan, Red Fort, Raj Ghat- Cremation site of Mahatma Gandhi, to India Gate - a 42 meter stone arch built in the memory of the Indian Soldiers who died in World War I, Drive past the President's House & Parliament House, Humayuns Tomb a memorial by the Taj Mahals, the Qutab Minar, Birla Mandir and Lotus Temple. Morning leave for Agra, you will be reaching there by noon. Upon arrival check into Hotel Grand Imperial. Afternoon visit Taj Mahal - one of the seven wonders of the world, Red Fort and Itmad-ud-Duala. About the Hotel : Hotel Grand Imperial is located in the heart of the city of Agra, the hot seat of the Mughal Empire. The 100 year old Hotel is constructed of biscuit bricks which were also used in the construction of The Taj Mahal and the Red Fort. The Hotel played hosts to distinguished guests such as The Crown Princes of England and Japan. Morning drive to Jaipur enroute visit Fatehpur Sikhri which is the old capital of Mughal, still preserved in good condition. 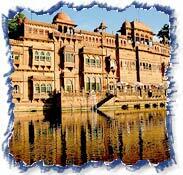 Proceed to Jaipur and check in at Raj Palace or Jai Mahal Palace. Evening you may visit the colourful local markets. 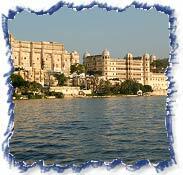 About the Hotel :Hotel Raj Palace  It was voted as the World's Leading heritage hotel" by The World Travel awards 2007. It is one of the only places lived by the Maharajah that has been restored to its original glory and charm. Hotel Jai Mahal Palace - Set amidst 18 acres of beautifully landscaped Moghul gardens, this incomparable Palace dates back to 1745 A.D. A masterpiece in the Indo Saracenic style of architecture, it blends spotlight-grabbing opulence with tantalizing comforts that transport guests to a world of Rajasthan magnificence. It is located downtown, close to the main shopping center and historical monuments. Morning excursion to Amber Fort - capital of the old state of Dhundhar, located on the rugged hills that surround Jaipur. Painted elephants will take you up the hill to admire the massive getaways, courts, stairways and pillared pavilions and palaces that recall the glory and wealth of Amber's association with the Mughals. Afternoon city sightseeing visiting the City Palace Museum (still houses the erstwhile royal family) Jantar Mantar - the Royal Observatory and Hawa Mahal (Palace of Winds) -built for the royal ladies to watch the activities on the market street below without being observed themselves. Morning drive to Bikaner. After lunch in Bikaner, drive to Gajner (half an hour drive). Check into Gajner palace. Afternoon free for leisure. About the Hotel : Gajner Palace - Spread over 6000 acres, it was built on the banks of Gajner Lake by Sir Ganga Singhji, one of the greatest Maharajas of Bikaner, in the early decades of the twentieth century. Gajner Palace was used as a hunting resort by the former Maharajas and visiting British dignitaries during the days of the Raj. The red sandstone palace is distinguished for its architectural grandeur and luxuriously appointed suites and rooms. The greenery at Gajner Palace, lawns and the chirping of birds and peacocks make it a truly memorable destination for leisure and corporate travellers. This desert town in the north of Rajasthan is a largely unspoilt. The tour of Bikaner starts with a visit to Junagarh Fort with its superb stone carving. The fort has the usual collection of Rajput miniatures and an extensive collection of weapons including two World War biplanes. The other notable place that you will visit is the government camel breeding farm unique in Asia. Morning drive to Jaisalmer, you will be reaching there by afternoon. Check into Gorbandh Palace. About the Hotel : Gorbandh Palace is distinguished over the centuries for its golden fort. The hotel provides spectacular views of the acclaimed fort and is well-connected to the famous Sam sand dunes. The hotel organizes desert camps with Rajasthan's celebrated folk music and dance around a campfire on starlit evenings at the sand dunes. Morning visit Jaisalmer Jain Temple, Various Havelies noted for its art & craft works, Gadi Sagar tank & museum, Jaisalmer Fort etc. Afternoon excursion to Sam sand dunes. This is the closest place from where you can loose yourself in 'the Great Thar Desert'. Join a camel caravan and ride along the breathtaking crests and troughs. Morning drive to Jodhpur, enroute visiting Osian Temples dated back to BC. You can once again explore camel ride here. Proceed to Jodhpur and check into Ajit Bhawan. About the Hotel : Ajit Bhawan - India's first Heritage Palace Resort, "The Ajit Bhawan", is a home to the members of the Jodhpur Royal family. Set in the serene desert of Rajasthan, Ajit Bhawan stands as an oasis of hospitality and warm Rajput charm. Built exclusively for Maharaja Sir Ajit Singhji Rathore, the younger brother of Maharaj Umaid Sinhji of the erstwhile Jodhpur state. The Ajit Bhawan offers you Old World Elegance with the modern comforts of a classic heritage resort and the essence of being a guest of the Maharaja's family. Morning city tour of Jodhpur visiting Mehrangarh Fort, Umaid Bhawan Palace Hotel & Museum, Jaswant Thada, Mandor Garden, Clock Tower & Sadar Bazaar. Afternoon drive to Ranakpur and check into Hotel Fateh Bagh. About the Hotel : Fateh Bagh - In 1802, Rawla Koshilav flourished Fateh Bagh as a palace on the foothills of Aravallis. In 2002, almost 65,000 pieces of the crumbling palace were transplanted in Ranakpur, amidst the orchards and on the banks of a rain fed river, to create Fateh Bagh. The Royal Retreat holds the promise of nurturing your body, heart, mind and soul for visitors from far and near. About the Hotel : Aodhi - The structure of this Royal Retreat has been designed to match the landscape of the terrain. The Aodhi has a picturesque hilly and lush setting, not far from the citadel. The resort abounds in natural beauty and promises a delightful sojourn from day work tribulations. Its deluxe suites and rooms are elegantly appointed, with private balconies and sitting areas. A large swimming pool, green lawns and the spread of old trees make The Aodhi a perfect getaway. Morning drive to Udaipur and check in at Shiv Niwas or Fateh Prakash Palace. Afternoon excursion to Eklingji and Nagda Temples. Fateh Prakash Palace - Built along the shores of Lake Pichola, named after one of Mewar dynasty's greatest rulers, Maharana Fateh Singh (period of reign: 1884-1935), the palace is a repository of exquisite chandeliers and rare paintings, unique crystal and crockery collections. Full day city tour visiting Pratap Memorial, City Palaces, Jagdish Temple, Bharatiya Lok Kala Museum, Saheliyon Ki Bari (Garden of the maids of Honor ), Fateh Sagar, Pichhola Lake etc. Morning transfer to airport to connect flight for Delhi for your international flight back to home. i) Room on sharing basis at each place as per itinerary for total 14 nights. Hotel check in / out 12:00 hrs. 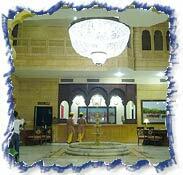 ii) Daily buffet breakfast at hotel and breakfast and dinner will be provided at Camp at Jaisalmer. iii) Aircon Large Car (Toyota Innova) for all transfers and sightseeing as per the itinerary. vi) Camel Ride at Sam Dunes and Osian. vii) Jeep Safari + Entry fees at Kumbhalgarh Sanctuary. iv) Any Monument entrance fee (to be paid directly at the monuments). Please find below list.